On my recent trip to western Sicily for a family wedding, I tasted many delicious dishes, but none was more distinctive than the couscous di pesce, also known as couscous alla trapanese after the city and province of Trapani in western Sicily where it’s from. The fact that Sicilians eat couscous is a legacy of the Moorish rule over the island in the early Middle Ages. But while in the Maghreb couscous is typically eaten with lamb and vegetables, in Trapani it is accompanied by a spicy fish soup made with the bountiful local seafood. 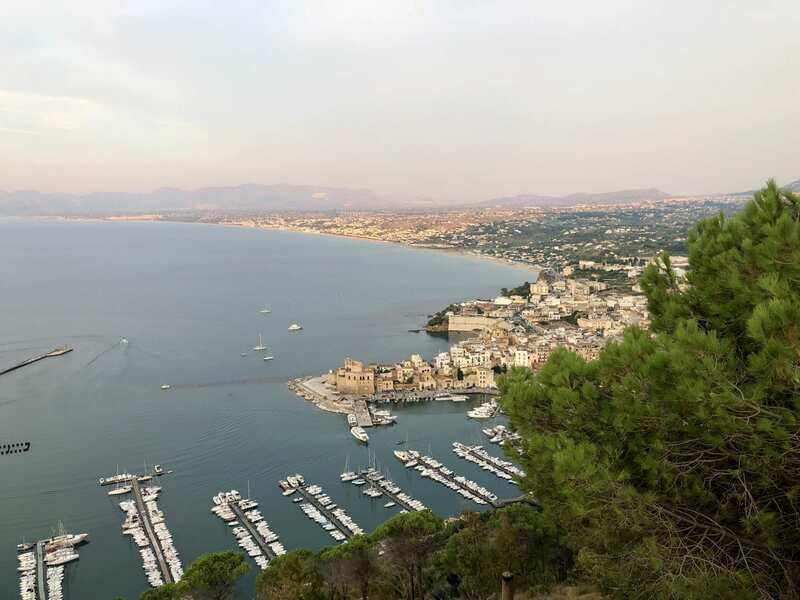 I had couscous di pesce twice during the trip, once at a dockside restaurant in Castellamare del Golfo and once at a farewell dinner for the happy couple at the home of our hosts on the last night of the trip. On that second occasion zio Piero—who had prepared the dish entirely from scratch—was kind enough to explain to me how he made his version of this iconic local dish. This streamlined version of Piero’s recipe essentially cuts out the most laborious and time-consuming part of the process—making and steaming the couscous—by using pre-cooked couscous. You can put this version on your table in less than an hour, instead of the five or more it takes to make the dish entirely from scratch. Is pre-cooked couscous as good as the homemade version? Not quite, but it comes surprisingly close. And the soul of the dish— the fish soup—is as exquisite as ever. In a pot large enough to contain all your seafood comfortably, sauté the onion, carrot, celery, parsley, garlic and red pepper flakes in abundant olive oil over low heart until quite soft. Add a pinch of salt as you sauté, taking care not to let anything brown. Add the tomatoes to the pot and let them reduce for a few minutes into a saucy consistency. Lay on the fish and other seafood, then add enough water to cover the seafood, along with the bay leaf and saffron if using. Simmer, uncovered, for a good 20-30 minutes, until the seafood is cooked through and broth is very flavorful. Taste and adjust for salt. Remove the fish and other seafood from the pot. Using a paring or boning knife, remove the skin and filet the fish. Cut the filets, if need be, into serving-size pieces. Place the fish filets and shellfish in a bowl and cover to keep warm. Discard the fish heads, skin and bones. Pour the remaining broth through a fine sieve, pressing out the liquid from the solids, and return it to the pot, along with the seafood. If you are using pre-cooked couscous, you should follow the measurements and instructions on the package, but using the fish broth or a 50/50 combination of broth and water instead of water. Generally speaking, the instructions will tell you to add pre-cooked couscous to hot liquid and allowed to steam off heat. Bring the required amount of liquid to a boil, add the precooked couscous, together with the chopped almonds and spices, give it all a good stir and cover. Let the couscous stand for a good 5 minutes, or until the broth is fully absorbed and the couscous tender. Once the couscous is cooked, fluff it with a fork. When you are ready to serve, bring the broth back to the barest simmer to reheat the seafood. For a family style presentation, serve the couscous in a large serving bowl, perhaps topped with more chopped almonds and a few pieces of seafood, with the fish soup in a separate soup terrine. Each diner can take a portion of couscous, and top it with the seafood and a good ladleful of the borth, to their taste. For a fancier presentation, you can plate individual servings as pictured here. Ideally, the fish you use for a couscous di pesce will be whole fish with bones and head, which give more taste to the broth. The heads and bones are then removed as indicated above. This is probably the trickiest part of the whole recipe, as you need to gingerly scrape off the skin without damaging the flesh—it should actually come off quite easily—and then lift the fillets underneath off the bone, again ideally without damaging the flesh. It’s not all that difficult, but it does take some time and care. I think it’s well worth the effort. Even so, whole fish can be a challenge to find in some US markets, where fish is increasingly sold in pre-cut fillets. If that’s all you can find, do try to beg off a fish head or two from your fish monger. Add them to the pot to simmer along with the fish, then discard them. They will lend the broth a lot of extra flavor. The measurements in this recipe are based on Piero’s description during dinner but involving a fair amount of semi-educated guesswork on my part. As is usually the case for iconic dishes like this one, recipes are all over the map. The amount of fish can be varied according to tastes and your appetites; some recipes call for double the seafood called for here, others less. Ditto for the amount of tomato, which varies wildly from recipe to recipe, with some quite ‘red’ and others calling for just a hint of hint of tomato. Some recipes call for passata di pomodoro as here, others for tomato concentrate. Piero said he uses chopped tomatoes, fresh in the summer and canned in the off season. Zio Piero makes his couscous by hand, steaming it for a good two hours. While the couscous is steaming, he prepares the fish soup. 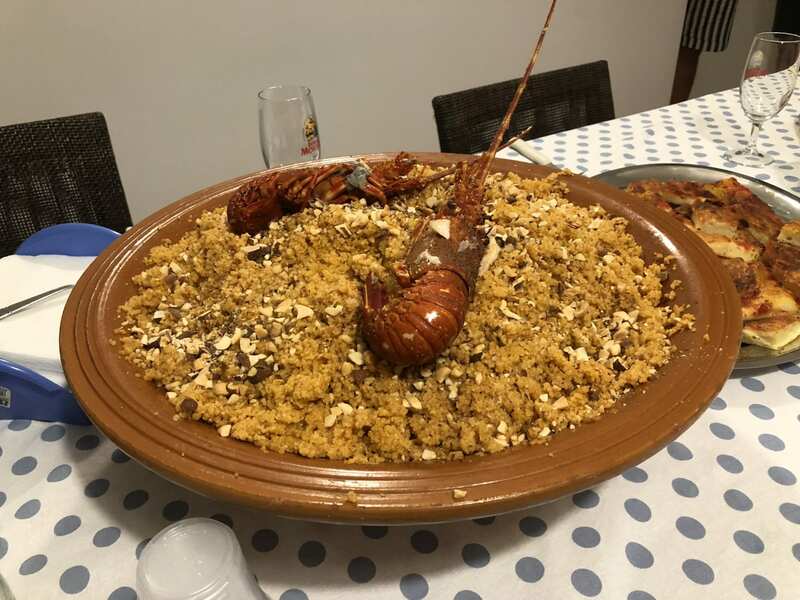 He then transfers the steamed couscous to a large terracotta bowl, called a mafaràdda, mixing the steamed couscous with a generous portion of the fish broth. He lets the couscous rest, covered, for a hour, to absorb the broth, then repeats the process twice more, producing a very flavorful, deep red couscous, as pictured below. The whole process, Piero told me, takes five hours. It’s definitely a labor of love! Apologies for the quality of the cellphone photo, but trust me, the couscous was red..! Piero’s fish soup included a long list of local fishes that I neglected to jot down. But I do remember it included both grouper (cernia) and rockfish (scorfano). The soup was mostly fish, but most recipes for couscous di pesce include all sorts of seafood including squid, shrimp and mussels. Langoustines like the ones that topped Piero’s mound of couscous would be lovely, too, if you can find them. In any event, as with most fish soups, you can use what the fishmonger has on offer that day. I used branzino, as my fishmonger didn’t have grouper or rockfish that day. Whatever fish you use should be firm-fleshed, so it doesn’t fall apart in the cooking. This is especially important because, as you may have noticed, the cooking time for the soup is fairly long. As a result, the fish itself turns out a bit overcooked, at least to my taste, but as Piero pointed out, the real point is enriching the broth to flavor the couscous. The fish itself is secondary. But if you want better textured seafood at the cost of a slightly less tasty broth, you can add the fish in phases, starting with the seafood that takes the longest—like the squid—then the whole fish, perhaps about 10 minutes later, and then the most delicate items like the shrimp about 5 minutes before the soup is done, leaving the mollusks like mussels to the very end, cooking them for only the minute or two it takes for them to open. Piero gave me only a fleeting description of how he made the couscous itself. A chef can’t reveal all his secrets, after all! But he did mention that he formed the couscous by rubbing the dough with both hands, as if he were washing them, not by working it against the bottom of a bowl or other surface as many people do. 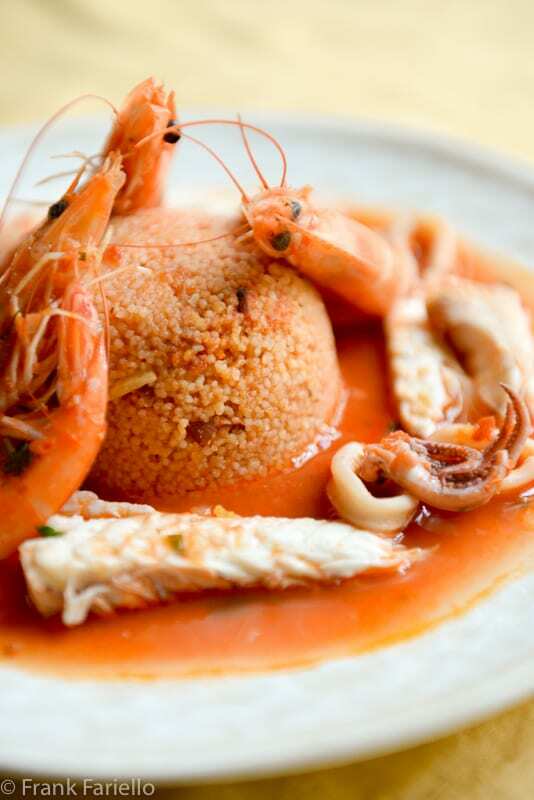 But generally speaking, homemade couscous involves a process call l’incocciàta in Sicilian. You sprinkle water on coarsely ground semolina flour (semola) and work it into the flour with your hands in a circular motion, sprinkling more water as needed until small grains are formed. You then drizzle the grains with olive oil to keep them separate, along with other flavorings. (NB: In some recipes, the order is reversed, with the oil added first, then the water.) This video (in Italian) demonstrates the technique rather well, I think. There’s a middle ground between pre-cooked couscous and making you own by hand: packaged but uncooked couscous, often imported from Morocco or another of the Maghreb countries. As for pre-cooked couscous, should you once again follow the instructions. But generally speaking, this kind of couscous will require steaming over salted water, after which, for this recipe, you transfer the steamed couscous to a large bowl, then moisten it with a few ladlefuls of the fish broth. You then let the seasoned couscous stand for 30 minutes or more, to allow the flavors to meld. Amazing. I had the same dish in the same restaurant in Catella Mare del Gulfo back in 1991. My family is from there and Trapani and we even have a special clay pot to make the couscous in. Cuscuzu has always been a family tradition although ours was never spicy but always contained white fish like black fish or grouper. So cool. Thanks Antonio! It really is a wonderful dish. Not part of my family tradition but I’m happy to have tried it. Oh yes! This is great! I must say I have never done this dish before. It must work so well cous cous with fish. I love it, thank you! And thank you for stopping by, Alida! This sounds delectable and your wonderful photos have me wanting to try it soon. I’m pinning. I loved seeing all your photos while you were in Sicily, Frank! I’ve never been to the western side of the island, but trust me, it’s on my list! This post is EXACTLY what I love so much about travel! Discovering new flavors and dishes from the region one is visiting. In the past 10 years or so, I’ve really expanded my seafood experience. While I’m not a huge fan of couscous, I’d totally love to try this dish! Your version looks beautiful to boot! Thanks, Christina! I think this version might well change your mind about couscous. Worth a try, anyway! So interesting! And a fabulous recipe. I had no idea couscous had made inroads to Sicily, though I shouldn’t be surprised. The subtlety of the saffron in the soup and the cinnamon and nutmeg in the couscous tying together that influence with the local flavors in the soup itself sound truly great. Catch of the day done proud. wow, this looks amazing, thank you, i recently started learning couscous and you recipe helped me a lot, though the steaming process is different from one recipe into another, there is another great course in Udemy (Cook 3 Couscous recipes easily) that helped me a lot, the only difference with yours is that they used water in the steaming process and not a combination of broth and water. What a unique and awesome recipe, Frank! I love that you recreated this one from Piero’s description. A 5-hour recipe is definitely a labor of love, but there’s nothing wrong with that…especially on a cold weekend day. I do support your shortcut of pre-cooked couscous though. Speaking of couscous, I didn’t realize it was so common around Sicily. What an interesting tidbit! And another thing that struck me about this recipe is the use of shellfish with heads on. I think the first time I saw finished dishes with head-on shellfish was in Italy, and I remember being shocked. But the presentation is incredible! And, as you note, the flavor is boosted, too. Thanks for sharing this fun recipe, my friend! That sounds/looks incredible. Couscous by hand?! Oh my. How delightful to get another ‘useful’ and ‘easy’ recipe from you I know I shall prepare! No, no, shall not make my own couscous but shall read what you have said, and to winch Iain and Iagatta have interestingly added . . . I oft also turn to Tunisia when I look at and for N African recipes . . . Thanks so much for your comment, Eha. I have fond memories of Castellmare del Golfo and have enjoyed a variety of spectacular fish dishes. This recipe is a treasure Frank, thank you for sharing. And thank you for stopping by, Paula! PS If I was doing this (and I certainly will soon) I’d probably fillet the fish and shell the prawns before hand and then make a fish broth from the heads, trimmings and prawn shells (and maybe other fish bits bought in), simmered at most for 20 minutes, put it through a sieve or food mill (as in Marcella’s fish soup) and added to the soffrito and passata as in your recipe but only adding the fillets and shellfish for a very brief (c 10 minutes at most for the fish and five for the prawns) cook at the end. Squid would also likely show up somewhere too. Living in France has very much influenced my cooking these days. I have been a big fan of couscous since my first encounter with it (and harissa!) in a student dive in Paris in 1974. I live in France now for half the year (in Nice) and couscous joints are ubiquitous there, the French equivalent of the curry house in the UK. In France what you almost invariably get is ‘white’ couscous, that is couscous that has been cooked with plain water, rather than broth, from the uncooked kind (found in kilo bags in all supermarkets or available in 50kg sacks in my local Tunisian groceries). My default method is as follows: put equal quantities couscous and just boiled water in a microwaveable vessel, add a pinch of salt and a tablespoon olive oil, stir together thoroughly and leave for a couple of minutes. The couscous will have absorbed most if not all of the water. Then microwave on full for two minutes. Allow to cool for a few minutes then turn out into a bigger bowl and break up any lumps (you may need a little extra water to do this). Stir in a knob of butter and return to the microwave vessel. Immediately before serving reheat for a minute on full. Turn out on to serving dish and dress with a little more butter. Another difference is that vegetables (chickpeas, courgettes/zucchini, carrots, potatoes, small turnips, broad beans) are also included (or served separately in broth) in large chunks or, as I saw in Tunisia on a recent trip, cooked whole. Tunisians also use broth to cook the couscous (which is thus red), pack into an individual dish and spread the meat/fish/whatever on top. And couscous isn’t couscous without harissa! And if you’re ever in Paris my favourite place for couscous there is Chez Omar on Rue de Bretagne. Great food and wonderful Parisian atmosphere. I’m not sure I mentioned it, but I lived in Paris for a couple of years back in the day. I have very fond memories of the couscous there, delicious and usually quite affordable, too. Too long ago to remember any addresses. I’ll make note of Chez Omar for my next trip there, thanks! It is wonderful. Fish couscous is also very popular in neighbouring Tunisia. I use pre-cooked couscous – some are excellent quality now, and even organic – but do steam it in the traditional way (taught by Maghrebi friends) instead of boiling it. Tunisians also make a fish stock for this dish. Actually the family-style presentation can be quite spectacular as well, but the plated version would do better at a formal business dinner. Indeed, the family style presentation we got, as you can see, was plenty impressive in its own way. What a great sounding dish. We love all types of fish soups, so this is a must try. We can’t do nuts (nut allergy), what about using pine nuts or pumpkins seeds instead of almonds in the couscous? Sure, pine nuts would provide the same nutty flavor. Or you can just leave it out, of course. Won’t change the result all that much. This looks good — couscous has such an interesting flavor, and it’s a wonderful base for all sorts of proteins and veggies. I lived in Morocco in the 70s, and had it a lot (including fish couscous). I’ve actually done the made-by-hand couscous. Once. It’s a lot of work! I always use the packaged stuff — almost as good. (Even better if you steam it before you use it, but I rarely do.) This is a terrific recipe — thanks. John I’m really impressed that you made your own couscous by hand! I can believe it was a lot of work. And btw, Morocco must have been a lot of fun, especially back then! Mmmmm che bontà ! I fancy some right now ! Thanks so much, Linda! I’m sure you’ll enjoy it if you try it. Frank – I am so glad (and a wee bit jealous) that you had a hands-on lesson with Zio Piero. Although it is time consuming, I sometime hope to make my own couscous. I saw some women in Morocco making it and the “rubbing between hands” method is what I saw. And I can imagine the difference. As you can imagine, getting whole fish in Tucson will be a challenge, but I will try. Oddly, rockfish has been showing up at the fish counter of my local grocery… but even they don’t see the heads. There are very few true fishmongers here… Still, I will manage and will, perhaps, make this for my birthday next weekend! Looking forward to more Sicilian fare… just about a month till we go! Anyway, the fishmonger situation is not too different around here, but there are one or two true fishmongers left. If you do try this out, do let us know how you guys liked it. Grazie molto per questo cibo meraviglioso. Buona fine settimana !